In what is now Centennial Park in Nashville stood this large Bur Oak that dated back to Revolutionary times. The tree and the Cockrill Spring marked the northern terminus of the original Natchez Trace and many travelers of the Trace reportedly rested under the shade of the tree. A blacksmith shop once stood nearby to the tree and was owned by John Cockrill, one of the early founders of Nashville and the brother-in-law to James Robertson. 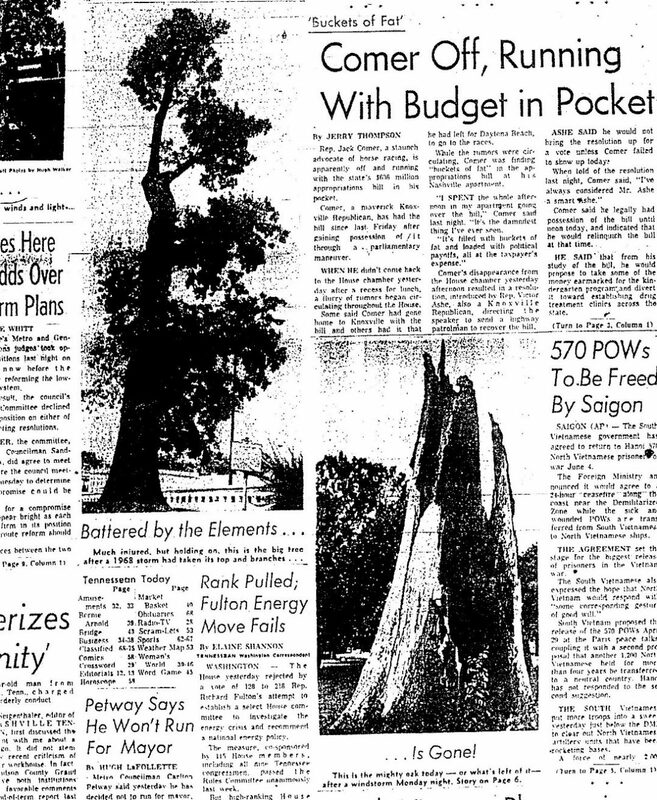 The tree was over 72 inches in diameter but was substantially damaged in a storm on July 21, 1966. A remnant of the tree remained standing in the park until May of 1972 when another storm removed the remaining part. Another Bur Oak was planted in its memory on the site in 1971. The oak was nominated as a Heritage Tree by Kevin S. Key of the Metro Tree Advisory Committee.